The earliest bicycle was a wooden scooter-like machine called the 'celerifere', invented in France in the 1790s by the Comte Mede de Sivrac. In 1816, a German baron, Karl von Drais de Sauerbrun, invented a model with a steering bar attached to the front wheel. He called it the 'Draisienne' and displayed it at the Paris Exhibition of April 1818. But the real development of the modern bicycle began in the 1860s. Pierre and Ernest Michaux, father-and-son carriage makers, invented the 'velocipede', which had both handlebars and food pedals. Its front wheel was larger than the one at the back; both, however, were made of wood. This meant that riding a velocipede was a very uncomfortable experience, and led to them being satirically described as "boneshakers". The 'safety' bicycle was introduced in the late 19th century, superseding earlier models. Its wheels were of equal size, with the pedals turning the back wheel by means of a chain drive. Further improvements were made when rubber types were introduced making the ride much smother. 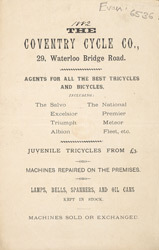 Coventry was one of the most prolific manufacturing centres of the country and by 1871 some 70% of Britain's cycling industry was concentrated in the Midlands.